Cloud services like OneDrive and Dropbox are dead-simple to set up and make multi-device file syncing an absolute breeze—but those services force you to stash your files on the company’s third-party servers. For some people that’s just not an option, or at least an option they’d rather do without. But there’s another easy alternative that lets you automatically sync files between devices even if you don’t trust the cloud: BitTorrent Sync Beta. Harnessing the distribution power of the BitTorrent protocol, BitTorrent Sync Beta—which I’ll call BTSync from here on out—lets you sync files across devices or share them with friends using peer-to-peer file sharing technology. Files are also encrypted in transit, and since there’s no real cloud service there are no storage limits beyond the hard drive size of your devices. BTSync is also flexible. You can specify which folders to sync between devices. You can share documents with other BTSync users in read-only mode (meaning they can’t change the file on your devices). Advanced users can even use BTSync to track document versioning. But there are some downsides to BTSync. You can’t sync specific files with specific devices. With BTSync, you either sync a folder among your devices or you don’t. You also need to have your devices powered on and signed in for BTSync to work; the BitTorrent protocol relies on both devices being active to share files. All that said, BitTorrent Sync is a terrific option for folks who want to sync data without relying on cloud services and third-party servers—if you know how to use it. Let’s dig in. Getting BTSync running is easy. Download the software from the BitTorrent website, then install it, keeping all the default options intact. When that’s done, you’ll see a “secret’’—a long string of letters and numbers—for the initial Sync folder. Don’t worry about it! You can retrieve it later. BitTorrent Sync as it appears right after installation. Once you’re done with the installation, BTSync opens automatically. With BTSync installed on the single PC, you’re essentially limited to adding local folders you’d like to have synced with other devices via My Sync > Add Folder. Next, you need to install the software on other devices. BitTorrent Sync supports a wide range of mobile and desktop operating systems, but we’ll focus on syncing with another PC first. Syncing data across PCs relies on the “secret” code mentioned earlier. Let’s say we want to share some videos that are on a PC called OFFICE with another PC called DEN. The videos on OFFICE are located at C:\Users\PCWorld\AwesomeVids. Open BTSync on OFFICE, right-click the AwesomeVids folder, and select Copy secret from the contextual menu. Now we have to get that secret code over to DEN—by email, snapping a picture of it on your phone, sneakernet, or even just writing it down and sticking it in your pocket. Treat the code with care—you wouldn’t want someone else using it to gain access to your files. To start syncing data from another computer you need to know the secret and decide where to save it. On DEN, click the Add folder button in BTSync, then enter the secret from OFFICE into the Folder secret field in the pop-up window that appears. Next, choose a new folder where you want to save the data, then click OK and let BitTorrent Sync work its magic. Syncing time will vary depending on file size and the speed of your Internet connection(s), naturally. Syncing folders to mobile devices is easier. Let’s say we want to share the same AwesomeVids folder on the OFFICE computer with an Android tablet. Open the program on the PC, select the AwesomeVids folder, and then click the Connect mobile button. You’ll see a QR code pop up in a new window. Now, open BTSync on the tablet and tap the Add folder icon in the top right corner. BitTorrent Sync on Android, taken on a Nexus 7. On the next screen, tap Choose folder, then select where you want to save the data on your tablet and press the Choose folder button. You’ll return to the Add folder screen. Tap Scan QR code, which will activate your camera. Take the picture! If your tablet has only a front-facing camera, the QR code may be a little trickier to line up. You can manually enter the secret code in the “or enter secret here” field under the Scan QR code button, too—that field is automatically populated when you photograph the QR code. Once the code’s there, tap Done. BitTorrent Sync works similarly on iOS, but with one major difference: You don’t have to choose where to save your synced data. Just snap the QR code and BTSync takes care of the rest. Note that both apps also have a backup option. On iOS, you can sync your photos to your PC, while the Android app can back up any folder you’d like. The setup process here is basically the same as above. Beyond syncing, you can also share folders with other BTSync users. You can give them the full-access secret code, as if you were sharing with one of your PCs, for example. But if you don’t want to give someone full, permanent access to your files, you can share a folder with either read-only or full privileges for 24 hours. 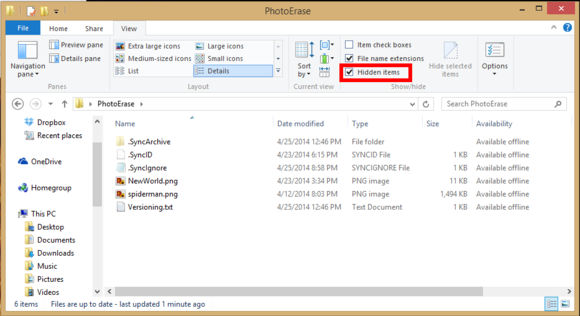 To share a folder, select it in BTSync, and then click the Info button in the main menu. From here it should be pretty obvious what you have to do. The permanent “Read only secret” lets you share the folder with others. Any changes you make will be pushed out to the read-only copy, but any changes made by the recipient of the read-only secret does not sync back to your folder. If you share a text document and give someone full access, then any changes they make to the text document are sent to your devices. But back to sharing folders! 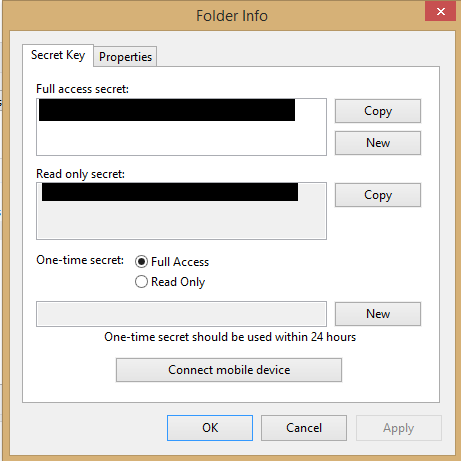 The One-time secret option creates a code that lets you share the folder with others, with either full or read-only access, but the code becomes invalid 24 hours after creation. It’s sharing with security in mind. You can also give mobile devices a one-time secret by clicking the Connect mobile device button at the bottom of the Folder Info window. BitTorrent Sync also packs some handy extras that give you additional control over the way your files are stored. Most helpful is BTSync’s version history feature, which let you retrieve older versions of a file you’ve changed. But BTSync’s versioning support isn’t obvious by default, and you need to change some Windows settings to view it. 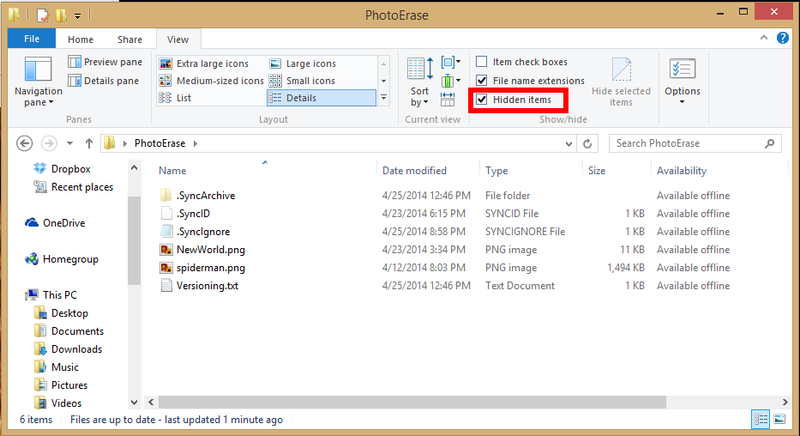 To use BitTorrent Sync’s version control you need to see the hidden items in File Explorer. A folder titled “.SyncArchive” will appear in the synced folder. Inside, you’ll see a collection of saved, older versions of files you’ve made changes to. Just go through the different versions until you find the one you want. BTSync saves 30 days’ worth of version history by default. You can change the duration by clicking on the Properties tab in BTSync window and then clicking Advanced. In the advanced preferences window, select sync_trash_ttl. You’ll see the number “30” appear in a Value text-entry field at the bottom of the window. Change that number to whatever the number of days you’d like BTSync to save version histories for, click the Set button, and close the window. While BitTorrent Sync is built around syncing entire folders rather than individual files at this point, you can force it to ignore specific files in a folder, which could be handy in sharing situations. Doing so requires tinkering with the “.SyncIgnore”file that appears when you enable hidden files in a synced folder (just like .SyncArchive). Open .SyncIgnore in your text editor of choice; Notepad works. 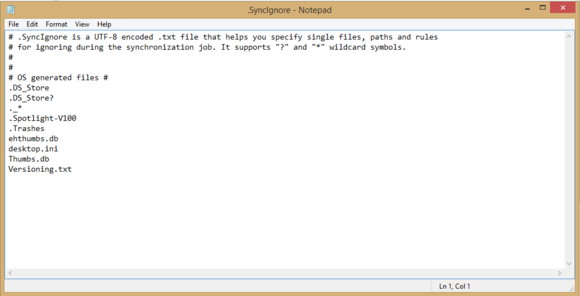 Start a new line in the .SyncIgnore file and type the name, including the extension, of the file you want BTSync to ignore, such as example.doc or example.jpg. If you want to ignore multiples files, create a new line for each. Don’t forget to save the file when you’re done! If you can edit a text file, you can force BitTorrent Sync not to share all files in a folder. Now for the caveat: .SyncIgnore will force BTSync to ignore this file for all devices, including your own. If you want to share specific files with some people but not others, you’ll have to create new folders for them and share the data normally. 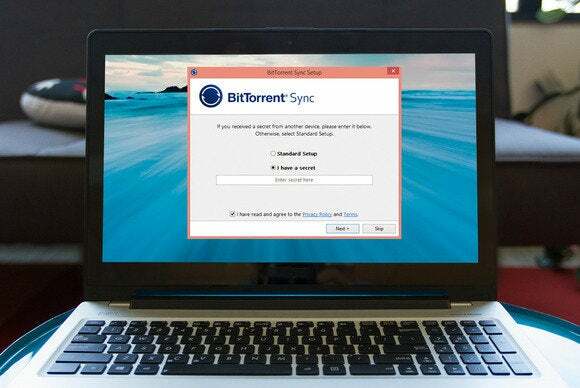 BitTorrent sync advertises itself as a cloudless option that lets you sync files without using a third-party server, but there are special situations where BTSync will use what’s known as a relay server to send a file between two client PCs. This usually happens if one side is behind a firewall or there’s some other technical reason that’s preventing the two devices from sharing files. In these cases, your files are uploaded to a BitTorrent server during transfer, though the company says your files are scrambled with AES 128-bit encryption, preventing BitTorrent from seeing your files. Your files are deleted after the transfer is complete. Bam! Now you’re free to enjoy the benefits of the cloud with any of its service outages—or privacy concerns.